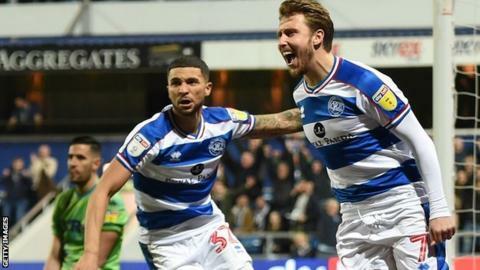 Luke Freeman scored the winner as QPR ended a run of seven straight league defeats to prevent Leeds going back into the Championship's top two. Freeman gave the hosts the lead just after the break with a neat finish from close range. Patrick Bamford and Stuart Dallas both brought fine saves from R's goalkeeper Joe Lumley as Leeds pressed for an equaliser but the hosts held out for a vital victory to end their slump. Marcelo Bielsa's side would have gone top with a win but defeat meant they remain third, behind second-placed Sheffield United on goal difference. Leeds had all the play in the first half but were unable to make the most of the chances they did create, Lumley producing a good save to deny Tyler Roberts. Freeman, who was the game's stand-out player, scored what proved to be the winner four minutes after the restart with a clever finish from a low Massimo Luongo centre. The R's, who move up to 17th, had a great chance to quickly make it 2-0 but Leeds goalkeeper Kiko Casilla denied Nahki Wells brilliantly after he had been played in by Freeman. Thereafter the visitors dominated but a combination of good keeping from Lumley and poor finishing meant they fell to a second defeat in five games. They can go top of the table with victory over fellow promotion hopefuls West Brom on Friday, while QPR visit west London rivals Brentford on Saturday. "We fought for each other tonight and that was the key thing. I was very proud of them. "We've been going through results that have been undeserved. We said to stay calm, not panic and that it will turn and we'd get the luck. "But you work hard for that and we worked hard. I thought it would take an almighty effort to win this game, but they were tremendous." "We didn't take advantage of the first half. In that first half we dominated the game. "They had a good five minutes at the start of the second half. From that moment the game changed. "They could then counter-attack and create danger and for us it took a while to build back into the game and create chances."